The source of the inspiration for this piece of art is peace and love. I preferred to attach infinity sign to the pigeons’ mouths instead of the olive branch. By doing so, I believe that I express my desire of peace and love which would last forever without any interruption. 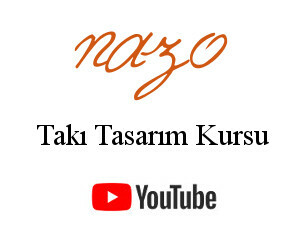 I used a different version of the technique that I developed -which is called Nazo weaving technique. In this work, I used sead beads and fish line as well as swarovski crystals. And I did not use any kind of metals in the necklace; the weaving technique itself created the strong structure. I have done this design depending on a suggestion of a friend of mine. She came to me with a heap of beads and wanted from me to design some work. This is the result. She was impressed with the result, as well.